my first flight across the Pacific in one of my favourite aeroplanes the Boeing 777, the world’s largest twin-jet. 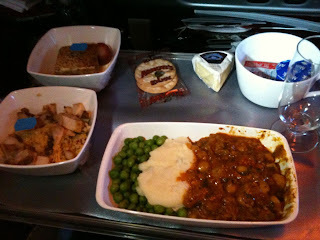 Plus I was in Premium Economy! For a plane geek lots of virginal experiences! Check-in at Melbourne’s Tullamarine airport was brilliant- very smooth and pleasant. From taxi to lounge via security, customs and duty free, in a little less than half an hour! Check-in was initially hindered by an inexplicable experience for me of being not able to find V Australia’s Check-in desks! The airport now has a weirdly ordered numbering system for check in counters and V Australia is located right at the back of the check in area. It was aided by the access to priority Check-in and security lines for Gold status passengers. 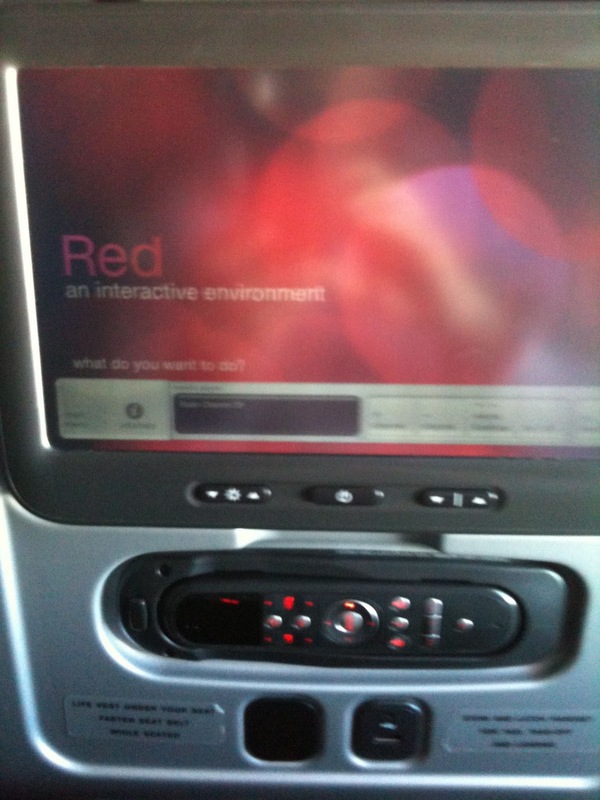 Thanks Virgin! One major disappointment with check in was that my requested seat had been given to someone else. I know V Australia do not guarantee seat requests but I like it when an airline gives you what you request/choose prior to flying. The new seat I was given didn’t excite me so Check-in staff shifted me to the bulkhead row. I like not having people in front of me and I like aisle access. When you sit on 90 planes a year, you become fussy! Keep watching the seat thing though, because it became weird later on. My bag (which i normally carry on) weighed in at 10.5kg (22lbs) because of 3kg of gifts I am carrying -so I checked it in which I dont often do! 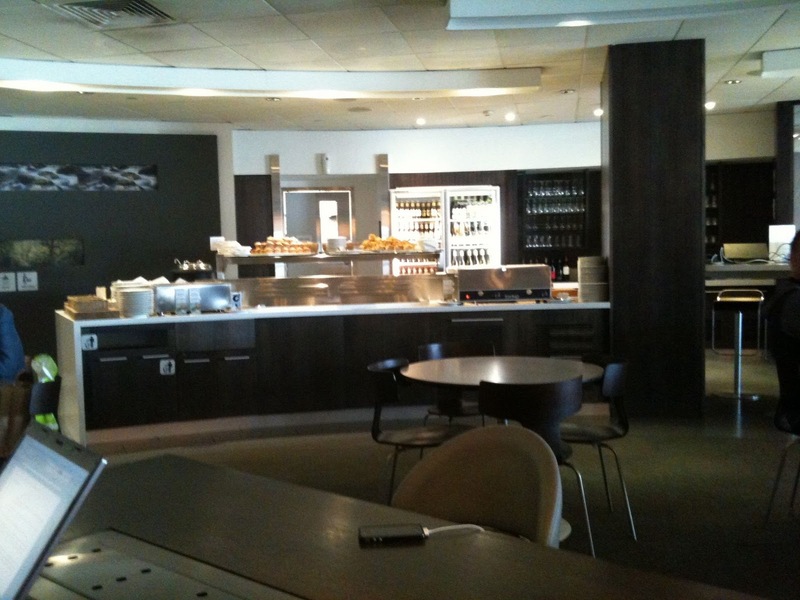 Lounge: V Australia use the fabulous Air New Zealand lounge for Business and Gold passengers. Showers, food and champagne! Heaven! (I do like my lounges!) My only complaint was that I could not log onto the Internet at all until the Air NZ flight to Auckland emptied the lounge. Suddenly Internet access was available to me but was very slow. The gate attendant took my pass to the supervisor’s desk and came back saying: “you need to go and see the supervisor“. So back I went, out of the immediate gate area to see the supervisor. When I got there, she brusquely handed me a new Boarding card; “you have been reallocated, as we needed to accommodate a family“. While I totally understand and respect that situation, l would have appreciated a “sorry” or a “thank you” – or that always hoped for upgrade to Business Class! To add insult to injury, I then had to line up again to have my boarding pass and passport scanned by a security officer before going past the same check in gate (no beep this time). Boarding the plane was slow. 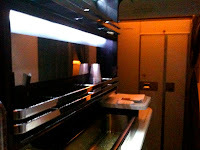 The on board crew were very friendly and welcoming- something they kept up all night- not easy to do on a 13+ hour shift. The plane for the flight over to the USA was V Australia’s very first plane Didgeree Blue (this was actually the runner up name in the competition to name the airline). I love the 777 and V Australia have decorated it brilliantly although the Economy seats look a little out of character. This was where things got a little weird. The gentleman occupying the seat in the Bulkhead row aisle seat that I had just been bumped out of was clearly sans family. He boarded by himself, sat by himself and yes I watched him deplane by himself. So if i was bumped out of my seat for a family, where were the family? If the other gentleman was moved out of his seat for a family, why was he moved into mine for which I had a boarding pass and not the one I eventually ended up in? Weird. Effectively this means I was shifted around the cabin four times. With Qantas, Air NZ and United, the seat that I request beforehand is always the seat I get at Check-in unless they upgrade me. Likewise the seat I get at Check-in with Air NZ, Qantas and United has always been the seat I have sat in unless I have been upgraded. I have no trust in V Australia that the nice aisle seat that is allocated to me in the exit or bulkhead row, might be traded for a middle seat at the rear of the craft at the last second. And on a journey this long, this could be a disaster for long-legged me! Having said, that the Premium Economy seats were comfortable and spacious. The bottle of water and impressive amenities kits were a delight. 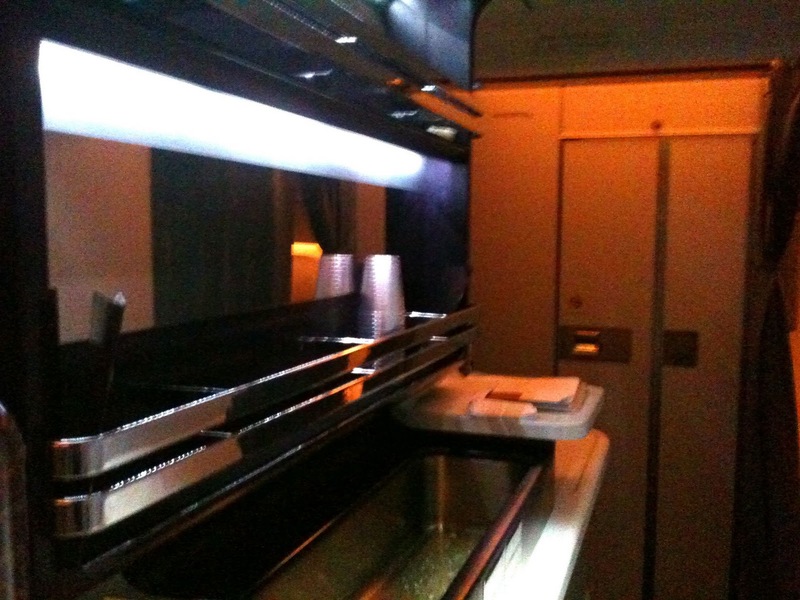 V also have a groovy feature in this cabin: a self service bar at the front of the cabin (Qantas have them too on the A380). I felt overall, V Australia’s Premium economy beat Qantas (and easily beat United) Premium Economy offerings on the same sector. Cabin Crew: Ashley, our very friendly and helpful cabin attendant welcomed each passenger personally with a drink. 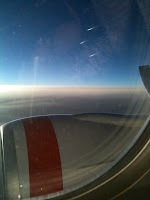 I chose the sparkling wine as did the passenger seated next to me, a Peruvian woman living in Hobart, Australia. Ashley and David were assigned to the Premium Economy cabin and looked after the passengers in their cabin very very well. Thanks guys. Nice wine too! Safety demonstration was thorough which always gives me confidence in a crew. Takeoff was brilliant. Boy, those engines are huge! We rolled slowly down the runway, gathered speed and climbed up over Melbourne’s western suburbs heading toward Port Phillip Bay. We had been warned of a few bumps on climb – and had none. We soared through a bank of fluffy white cloud over a sparkling Bay. Melbourne at its best. The very second the seat belt sign went off, the woman in front of the woman sitting next to me, reclined her seat to full recline bringing the TV screen centimetres from my new Peruvian friend’s nose! I was glad she was not sitting in front of me until she reclined her child’s seat too. What was funny was that the child was then too far back from the TV screen so the 5 or 6 or 7 year old had to lean forward. In other words the whole recline thing was wasted. I spent the flight wondering whether to ask the mother to un-recline her kid’s seat. Even fully reclined, it wasn’t too squashy for my long legs and I even slept for six hours which is really rare for me on a plane flight. I noted that passengers were not instructed to bring their seats up for meals which is common practice on other airlines I have flown on. Beverage/Meal Service: a full ten out of ten for all of the food served on the flight (except for the banana cake dessert -I hate banana cake so that’s my problem). Take note United Airlines with your appalling food on this sector (see previous blog post on my worst Pacific crossing experience. Entertainment: I loved the V Australia system: – user friendly with great selection. Is it the same as Virgin America system? 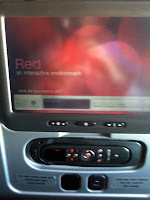 Either way, its got to be my favourite airline entertainment system. I watched 9 episodes of Modern Family (so much for not being a T V watcher!). I noticed the child in front of me was watching the Simpsons and Family Guy. The woman next to me enjoyed movies. 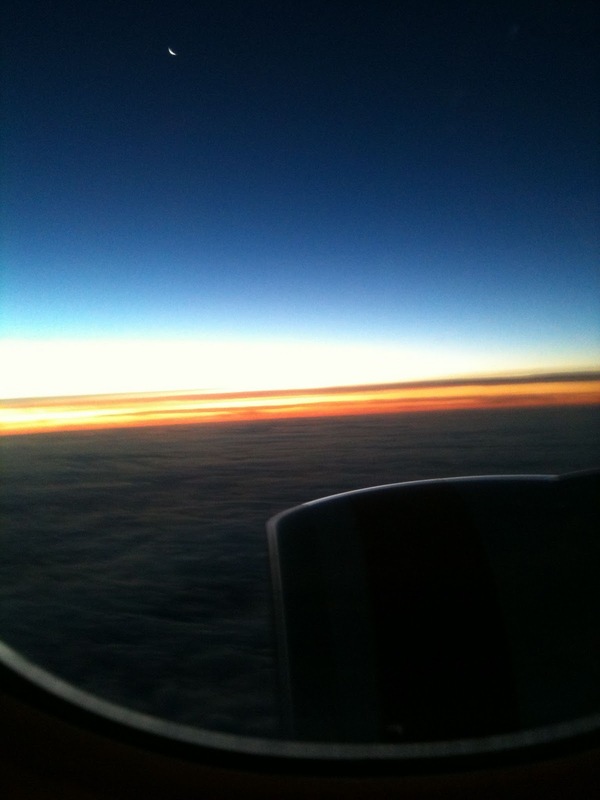 The flight was smooth the whole way across the Pacific. This is more luck than anything else as it depends on the oceanic weather patterns. I have had some very rough crossings over the Pacific. Two women in the on-board Bar were convinced that it was the 777 that made the trip so smooth. Another reason to love the 777? 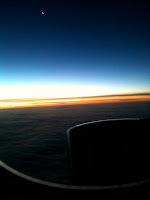 Dawn broke not far out of LAX and we landed beautifully into a clear cool Los Angeles day. The greatest disadvantage of V Australia appeared at this point. With Qantas, United and Air New Zealand, their planes roll to a gate in their respective terminals. Not so with V Australia. We kept rolling on the ground for ages before pulling up at aerobridge in the back blocks of LAX next to an Air Tahiti Nui and El Al plane. The air-bridge also took a long time to connect (so long in fact, that we were invited to sit again). We then climbed down stairs down to the airport tarmac. Waiting there were buses which completely disinterested LAX employees were hanging around. 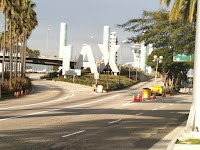 There was not one of them interested in directing people to the buses- dreadful welcome (what one expects from LAX). Our very full bus went for a very long drive back to the International terminal. With no directions from ground crew, we got off the bus and entered a series of corridors. 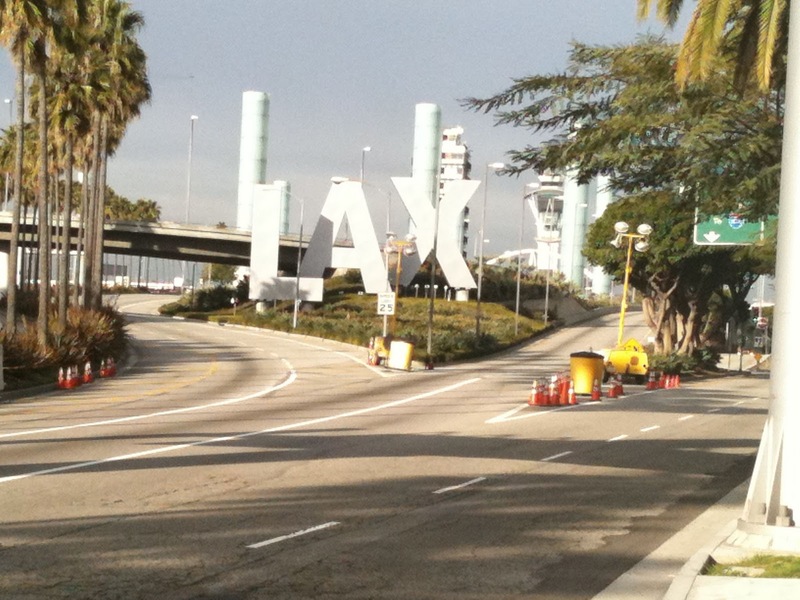 It was then a long walk through horrible LAX to get to immigration. The bright spot was that getting through immigration didn’t take me long as I was near the front of the group. When I was through immigration, I was pleased to find my luggage was waiting. From touchdown to street was about 50 minutes. I have been timing my treks through immigration and have been getting them under 30 minutes so V Australia was much slower for me here and believe me every minute in the LAX terminal after a 13 hour flight is excruciating. I caught my shuttle bus to the hotel and had a nice 2.5 mile run, shop, and sleep overnight before flying the next day to Dallas (see next blog post). Overall, I thought V were brilliant with almost everything. Where V mega-failed was the run around with the bizarre seating allocation and the equally frustrating runaround with the bus to the LAX terminal. These were not disasters and I look forward to my next V Australia trip in April. Anyone else had V Australia experiences?